Before configuring alarms and events in BTX, first make sure that AINVR is configured to send data to BTX via App-Tech's MXBridge. In AINVR, go to Alert tab, then Alert Rules, then in the Operations column, click the Edit button. In the Edit Alert window, click the Trigger Action button. 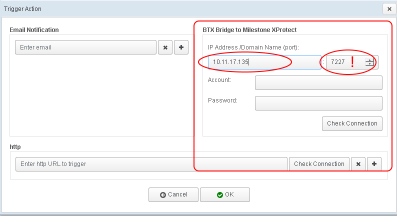 Enter the IP address of your Milestone server, and be sure to specify the Port as "7227" (This is the port BTX uses to listen for incoming data). Click "OK". Now, anytime an alert is triggered in AINVR, transaction data will be received by BTX.